I always did arts and crafts in the summer when I was a kid and sewed clothing as a teenager. But, as far as making “art,” that didn’t start until my daughter was 6 years old (I was 40 something). She showed talent in drawing, so I enrolled her in the Lakewood Arts Academy, a program for children run by Barley Vogel. It looked like fun, and I thought that drawing skills would help me create visuals for my lectures at the dental school. This was before so much software was available for this. I started in an adult drawing course and started painting soon after. 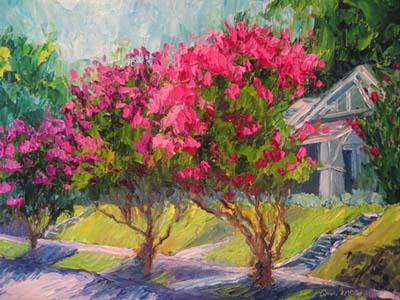 I did plein air painting for fifteen years with Suzanne Kelly Clark and still take painting classes with Niki Gulley. 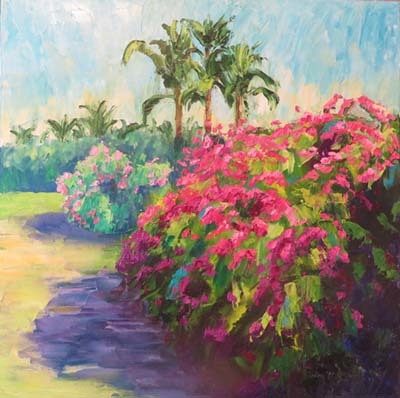 I like painting the landscape, and my mother inspired a love of flowers. She cherished her own flower beds well into her 80s. I like the excitement of being “in the flow” of painting. I guess I need to paint. Right now I can only paint on the weekends, so I really look forward to it. I want my paintings to make people feel good when they look at them or take them back to an event or person that makes them feel loved or happy. I am a “cup half full” person, rather than a “cup half empty,” so I want people to feel that optimism from my paintings. My daughter is an artist/working architect who went to an arts magnet high school. My “studio” is her former bedroom, and I keep her art all around me for inspiration. The only routine I can think of is I like to sketch with ink and watercolor. That is primarily what I do when I travel so I don’t have to take so much equipment with me. With my painting, color is the thing I focus on the most, intense and the contrast of complements. Mostly oil. I also do house portraits in ink and watercolor. I love the spontaneity of pastels. I worked a lot with them in the past and would like to do more of it. I don’t like the fact that they are more fragile and require matting, glass, framing etc. A pointed knife. I mostly use knives to create my paintings. I love the serendipitous strokes and blending that occur with a knife as well as the thick paint that can be applied. You will have to create interest in (market) your art, so focus on making relationships with many people to share your art with. If you wish, please share with us any other aspect of your art life—professionally and/or personally—that hasn’t been answered in the above questions. I look forward to retiring from my job as a college professor and painting full time. I also look forward to spending more time with other artists. 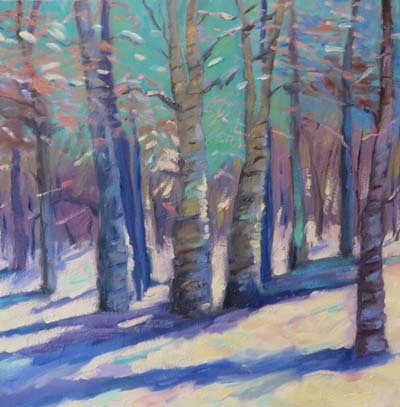 My paintings made viewers feel good- evoked happy memories. Becoming………………………. All the adjectives that came to mind- continuous learner, aesthete, seeker, innovator, change maker- fit into this one word.